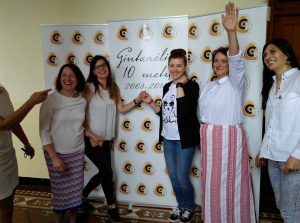 Cavan’s Lithuanistic school „Gintarėlis“ (“Amber”) turns 10! Our school has turned 10 years old! Just… 10 years old? 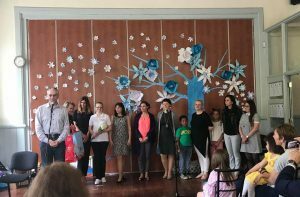 We asked that ourselves and our friends from various Irish cities who came to congratulate the school and celebrate our anniversary on the 27th of May. Is our school, which just turned 10, big or still very small? We invited the pupils, their parents and our dear guests to spend their Sunday afternoon with us and to explore the path of light and wonder. After all, whenever we celebrate our birthdays, we always stop for a second, think back, and reflect on whether the journey we had was meaningful. 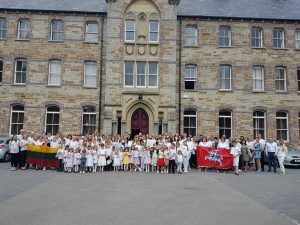 We were glad to see that the school has so many good friends and that we could share our celebration with Egidijus Meilūnas, the Ambassador of the Republic of Lithuania to Ireland, Virginija Umbrasiene, the Embassy’s Advisor, and Lithuanian schools from Dublin, Monaghan, Trim, Mullingar, Carrickmacross and Tullamore. The theme for our celebration and birthday was light. After all, everyone who is a part of the school is a very bright person enlightening others. This includes the pupils who come in every single Saturday morning to their classes, parents who encourage and motivate their children, teachers who sacrifice their weekends so that the younger generation would know and cherish Lithuanian language, and school friends who motivate each other, as well as help with mistakes or difficult concepts and encourage one another to do what we all love – nurture our mother tongue. 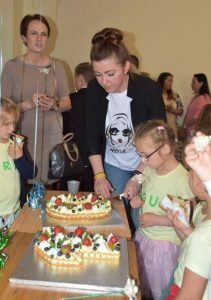 During our birthday celebration, two characters travelled down the road of light: the modern Lithuania celebrating its 100th birthday and Gintarė (who everyone calls Lithuanistic school „Gintarėlis“) celebrating her 10th birthday. Both characters went on a journey of light and values as they both faced a variety of questions: why do some people love Lithuania, while others do not? Why do some kids want to go to school, while others prefer to avoid it? …. Why does it sometimes feel like the same sun shines more brightly for some than for the others? Along the way, both travelers met many friends who shared their light and values with them. Gradually Lithuania’s and Gintarė’s melancholy thoughts were cleared and instead they were inspired to explore the world and never stop. The students of the Lithuanistic school “Gintarėlis” shared their memories of childhood joy, laughter, and many more positive moments. 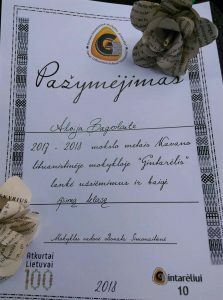 Other guests shared what Lithuania and Gintarė needed most: school from Mullingar „Bičiuliai“ (“Buddies”) brought us friendship, school from Trim “Šaltinėlis” (“Water Spring”) – life and energy, school from Carrickmacross „Saulės zuikučiai“ (“Sun bunnies”) shared their sunshine and positivity, school from Monaghan „Lietuvos vaikai“ (“Lithuania’s children”) shared some beautiful words, school from Tullamore „Lietuvaičiai“ (“Lithuanians”) brought us patriotic and sensitive verses, and the school “4 Vėjai” (“4 Winds”) from Dublin gifted us winds, which, when strength abandons, will give us power to go on and inspire! 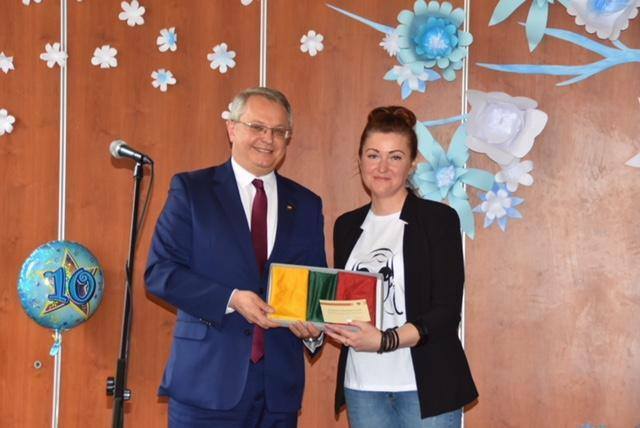 Ambassador Egidijus and the Advisor, Virginija, shared their light and awarded the teacher with letters of appreciation. We, the school, also received a copy of the Act of Independence found by L.Magulis. The Prime Minister, S.Skvernelis, gifted us the flag of Lithuania, the Minister of Foreign Affairs, L.Linkevičius, congratulated the school and the Head of the Department of Lithuanians Abroad, Marijus Gudynas, sent gifts and more congratulations. Our travelers’ path was getting brighter and easier because of all of the friends they met and the light they spread. Lithuania realized that people do love and respect her, even if they are not always able to show it. Amber was glad to find the answer to the question – is she big or still very small? The answer is big! That is because when you have such a big group of friends, students and parents who visit you every Saturday, you can not possibly be small. At the end of the celebration, we thanked parents for their contribution to the school’s activities and presented children with certificates for hard work. It has now become a beautiful tradition that the parents present the certificates to their children. This is a great opportunity to thank children for all their efforts, perseverance, for spending every early Saturday morning in school learning their parents’ and grandparents’ language. Light is what burns and shines in all us. Everyone who came to celebrate our birthday is a bright person, who shines and delights those around them. We hope to continue to grow, because the light you have brought has inspired us for greatness and to continue our work. Remember, #gintarėlisnesnaudžia (#gintarėlis_never_sleeps).